I think I can show this, and how the effort to invert these crime back against Syria is one of the more sickening things in recent history. My goal is to turn “Caesar” into another in the tradition of “Nayirah” and “Curveball,” known purveyors of lies used to justify two wars against Syria's neighbor, Iraq. But at this point, I'm not even sure I should publish this report. In some frustration, I speak towards President Assad and his advisers, the Syrian public, etc. and also past them to the global public. I'm speaking in English for the moment ... I may try a formal letter in Arabic next, if needed. I realize the physical war is more important than the information war, and of course that the "Assad regime's" explanations fall mainly on deaf ears, or worse. I noticed how Syria's request for UN probe of the rebel chemical attack on Khan Al-Assal in March, 2013 was met by the “world community” - stalling the investigation and threatening to turn it into a war-provoking inspections regime until mid-August, with "inspectors" finally arriving just in time to get sidetracked having to confirm sarin in the Ghouta CW attack instead, thus threatening war against Syria ... and investigators finally did confirm sarin was used in Khan al-Assal, but no one noticed, and along the way, rebels reconquered the town and launched a fresh massacre there, perhaps to silence witnesses or make the evidence inaccessible ahead of the probe (see my long article here). So I also understand that sometimes speaking up in search of truth and demanding a fair shake is worse than just ignoring the claims or anyone else' findings or opinions, and slogging on with the physical war. And slogging on, and on. There are other issues to balance as well - victim/witness and family safety, public morale, maintaining perceptions of strength, etc. Perhaps that's why, as I've heard around, Syrian officials seem reticent to discuss the issue of the "Caesar torture photos" in more detail. Maybe it's just too painful or could cause a panic, or worse yet some horrible terrorist backlash that gets blamed on Damascus and used as an excuse for war. Or maybe they have some degree of real dirty laundry mixed in with the lies, or it's all their crime after all, or maybe whatever. The reason for the hesitancy isn't known. That might be the most accurate characterization yet, but it's also a bit vague and formulaic-sounding. It wouldn't convince the people who really need convincing. And since then not much has been said (that I caught anyway). Maybe it got tricky and became a hush-hush subject. But then President Bashar Al-Assad just the other day brought it up again, without even being asked about it, in a July 1 interview with Australia's SBS (as transcribed here), which spurred this post. At one point the interviewer asks Assad about "thousands of government documents" said to have "proved your government sanctioned mass torture and killings." He clearly means the "Assad Files" as dubbed, which by the way do no such thing. Rather, they seem to be legitimate documents recording a government responding to a crisis, and then there have been attempts to fuse them to the Caesar photos. The closest solid link they could find was one instance of an official responding to reports of fairly mild torture (orders of magnitude from what the images show, anyway), and he was ordering that it be stopped. Otherwise, they have innuendo and more blah blah by supposed witnesses, implicating the men named in the documents in things that hideous (see my analysis here). It's another politicized and baseless sham in the regime-smear campaign, which underlies the regime-bleed campaign. "...the reports. The most important report that’s been financed by Qatar, just to defame the Syrian government, and they have no proof, who took the pictures, who are the victims in those pictures, and so on. Like you can forge anything if you want now on the computer. So, it is not credible at all." He's still saying this more than two years after the photos first made news? Does he care at all, or have anyone else checking into it, or anything? He didn't question the location directly, but Assad suggested the photos were perhaps digital forgeries. Carter-Ruck's commissioned experts say FBI analysts checked and found no sign of serious alteration. I tend to believe that - digital photo faking is tricky and rare. The photos might be faked anyway, but probably using on-site photography of actual bodies that still, to me, require an explanation. This on-site part is important, and helps explain how President Assad should have easy access to the answers. The photos were taken - at least partly and probably mostly - at the garage behind military hospital 601. In mid-March, 2015 the odd view at right was released, showing starved victims and allowing a correct and unquestionable placement. Mount Qassioun is visible to the northeast, and all foreground features consistently match. This puts Mazzeh prison nearby but off-frame to the right, and President Assad's palace off to the left, a couple hundred meters up the next hill. (See centered location on Wikimapia). Anyone contesting this placement (many have) should check the match as shown by Human Rights Watch (report) or by Bellingcat. It's not a political call but a simple visual match. In fact, I had already decided it was probably this spot – the middle building on the lot's south side - months earlier and from much less evidence - basically the info you can see below. That's from this (repaired) photo (was too washed-out), also shown below, analyzed for basic directions from sunlight (direction of view is southeast). It seems to be the same shed used in both photos, as if this is the usual place for this process. It would perhaps be marked as such. Maybe under the blur on the center pillar it says: place for (don't let the viewer see what). Unidentified bodies? For what it's worth, the date is unclear with my limited resources. On the right-hand edge of the photo, that seems to be the head and shoulder of distinctive victim 215-1895 (face) (and at right, shown by Al-Jazeera with number but not face). He and others of similar number are logged early in the folder 4-6 (June 4), 2013. That has a huge number of bodies added in a span only three days, suggested, so likely including prior images (last folder was dated March, and was not huge). There is also some February entries confusion, and the single woman victim, Rihab Allawi (600 entries later, 2935), is also in 4-6, said to die in February, April, and June, depending (profile). So it's unclear, and these folder dates are just the kind of thing that really can be reasonably faked anyway. But most photos are pretty clear in showing the same type of bodies seen here, the same type of numbers used, and/or at the same place. A handful are listed as from another hospital in Damascus (Tishreen), and one at least is probably from Dara'a, likely even in someone's home (Mahmoud al-Zoubi, an unusual case, and the very first one too, chronologically). So clearly, this is all in Syria and it does matter. But the question too few have asked is: just what is it they were documenting here? Of course, that's been explained already, but we're questioning those words. "spent 13 years working as a forensic photographer"
compare that list to employees who seemed to die suddenly around August 20, 2013, but left behind no body or one that could be someone else' (they faked it! Ha, tricked you! ), and then had his core family vanish right after (smuggled out so you couldn't kill them! Ha!). There should be one or zero employee files matching that story. Easy enough to narrow "Caesar" down from that pool, right? So if it the story is true, as everyone's been assured, the code-name would not serve its stated purpose of protecting his identity from the people with the files (and so the true reason to make-up a "curveball" type code-name could be debated). If there's no such person, then just focus on the first part of the last point, folks who vanished just before the Ghouta chemical attack, to find your defector. If he can't be the photographer, then find out who was (from photos and records) and find how that defector got hold of the pictures. Who are the victims in those pictures? It seems that the Carter-Ruck experts really don't know, nor do we. "Caesar" probably knows, and the Qataris might. And Syrian officials very well should know, or at least have a basic guess. Unidentified body numbers (as it seems these have) suggest it wasn't exactly known at the time. But there should be information on where the bodies came from and how they got in such a state. And presumably at least some were later identified. We've considered the Justice Ministry's statement from early 2014, and as mentioned, I suspect he's right. It seems likely these are initially unidentified bodies from clashes and, more substantially, of people captured by foreign-sponsored opposition forces, and killed en masse. By precedent, those would be soldiers and fighters of the SAA, NDF, and allies, and civilians seen by the terrorists as infidels or as supportive of the government, who had the misfortune of living in areas the killers controlled or could access. The evidence in and around the photos themselves is bearing it out in a number of ways. And Syrian authorities might have had that proven in some cases by family members, before they handed the bodies back to them. This alleged prisoner of Air Force intelligence #9227, for example, should not have been hard to identify. To his family, sorry. But he's all over the place anyway, I think in service of a lie. ...except I can match that number (sort-of) and enough body and lighting details to this face, even though it's listed wrong (killed by 227, not by 215). 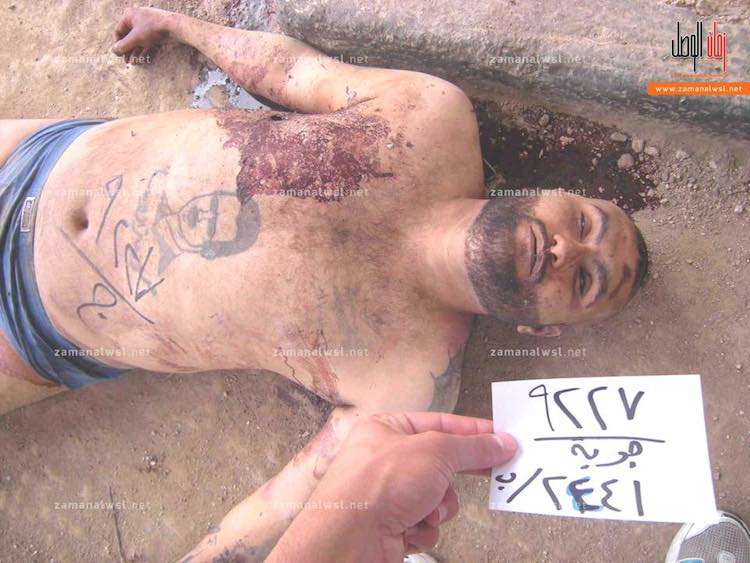 Next to him by body and correct, alleged prisoner number, is 215-3669, with a similar tattoo. Someone knows who these apparently Shia men are. And the Shia boy 215-3873 248-72 248-73, who got shown off in Geneva to bolster the bargaining position of Mohammed Alloush in "peace talks" there !! He's the political leader of "Army of Islam" from Douma, sworn to eradicating Shia from all Syria. Anyway, this boy probably didn't live too far from Douma, and someone knows who that is as well. Why is the global public left thinking he was a random victim of the Syrian government's continued existence? Again, I understand that if this is a terrorist crime, one goal is to terrify or demoralize the Syrian public, so maybe keeping the truth under wraps is better, from that standpoint. My research suggests it's one of the worst terrorist crimes of modern history, claiming an average of 1,000 victims a month between November 2012 and August, 2013 (by dubious folder dates, below mapped with hospital # timeline). The activists claim there were 11,000 bodies, according to this number. I can see it ticking to 10,000, so maybe it goes past 11. At least the 6,600-6,700 shown by the Caesar-Qatar-connected SAFMCD seem to exist. It's a lot of death here that's real and not digital. I wish it weren't so, but it is so. Were any of these unidentified bodies ever identified and claimed? If so, what might help is publishing a few sample cases, some best and safest ones, showing pictures to compare, and giving the victim's true back-story. For example: can't anyone recognize the distinctive boy victim 215-1895, as linked above? Or j-9227? As possible, could you tell us who did the capturing in these cases? There are a lot of people out here expressing a desire to catch the culprits. So let's get some names. Regarding the ostensible identifications so far offered by opposition parties: these are dubious, but may be partly true. They're presented to the masses here as obviously 100% true. Among these (Rihab Allawi, Ayham Ghazoul, etc.) can authorities check their own info and help us understand the truth-to-lie ratio here? Hospital 601 staff, forensic examiner Dr. Akram al-Shaar in particular, has been indicted in helping cover-up the alleged Mukhabarat extermination program. It seems past time to hear the other side of this story about what was happening there in those days. Can Damascus ever tell us if it's one or zero former employees who fit the description Caesar gives? If there is such a person, or sort-of so, what do officials know about the beliefs, behavior, and connections, etc. of the person or people behind these photos? Regardless of who took the photos, are they official documents reflecting an official process, or are they creative works made at 601 by abusing privileges? It seems the SAFMCD site with the identification photos is not able to be viewed inside Syria, at least in some of the major, government-held population centers. Is this a block by the Syrian authorities, or by someone on the SAFMCD's end? I can be contacted for any questions, etc. publicly by comments below, or privately (you know, internet private) by e-mail : caustic_logic@yahoo.com. Thanks in advance, to whoever, for whatever. Further questions, including for the Syrian general public, can be answered below in comments. July 25: I've heard another credible no, not visible except by use of special networks. Also I hear the signs suggest it's an internal block, by the government. 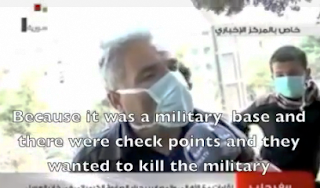 Was the Syria Chemical Weapons Probe "Torpedoed" by the West? Since the perplexing conflict in Syria first broke out two years ago, the Western powers’ assistance to the anti-government side has been consistent, but relatively indirect. The Americans and Europeans lay the mental, legal, diplomatic, and financial groundwork for regime change. Meanwhile, Arab/Muslim allies in Turkey and the Persian Gulf are left with the heavy lifting of directly supporting Syrian rebels, and getting weapons and supplementary fighters in place. The involvement of the United States in particular has been extremely lackluster, at least in comparison to its aggressive stance on a similar crisis in Libya not long ago. 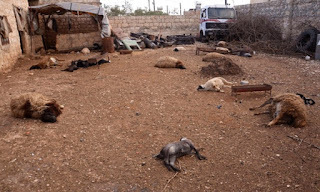 Hopes of securing major American and allied force, preferably a Libya-style "no-fly zone," always leaned most on U.S. president Obama’s announcement of December 3, 2012,* that any use of chemical weapons (CW) by the Assad regime – or perhaps their simple transfer - will cross a "red line." And that, he implied, would trigger direct U.S. intervention. This was followed by vague allegations by the Syrian opposition - on December 6, 8, and 23 - of government CW attacks. Nothing changed, and the allegations stopped for a while. However, as the war entered its third year in mid-March, 2013, a slew of new allegations came flying in. This started with a March 19 attack on Khan Al-Assal, a contested western district of Aleppo, killing a reported 25-31 people. Dramatic imagery run by state news agency SANA and from a Reuters photographer showed people – including children - suffering breathing problems, some already deceased. People said they could smell chlorine. Many of those who died were Syrian army soldiers. The full details of the case are best handled in a separate article, but in short, this incident has strong indications of being a rebel attack. There’s no clear guess from the opposition side which chemical agent (not sarin) was used, or what the delivery system was. The government version is clear: a homemade rocket that emitted a vapor of chlorine and saline hit near an army post. * Rebels in Aleppo have plenty of chlorine gas, some 400 tons or more stolen from an Aleppo-area factory seized by Jabhat al-Nusra (al-Qaeda in Syria) in August, 2012. They have many basing areas surrounding loyalist-held Khan al-Assal, custom rockets with reported ranges up to 60 km , and as far as we know warhead expertise obtainable to serious terrorist networks. Given all that, it’s little comfort to hear as a denial, from opposition spokesman Louay Meqdad, "we have neither long-range missiles nor chemical weapons. And if we did, we wouldn't use them against a rebel target." Syria, in contrast, swears if they had CW, they would never use them against their own people, even enemies like Meqdad. * 2016 Update: it seems the chemical tests (by Syrian and Russian experts) showed sarin was in this mix, explaining a death toll that a simple chlorine attack would not cause under normal circumstances (the death toll would most likely be zero from chlorine, was about 30 in the Tokyo subway attacks with sarin). 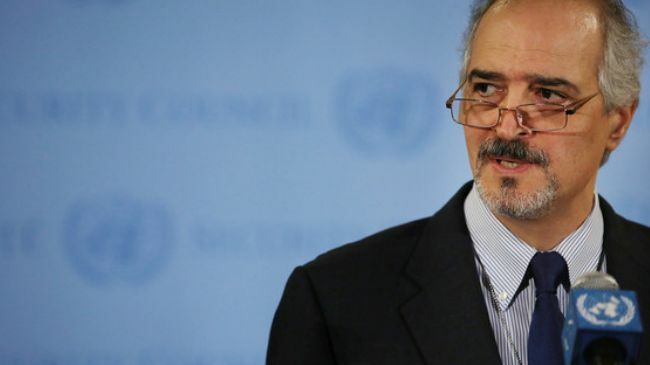 Syria demanded an investigation into the event by the United Nations, and everyone else agreed. A team was assembled, but then in early April Syria blocked them, for reasons that come across as mysterious. Soon, the world was hearing unprecedented recognition that perhaps Obama’s "red line" had been crossed - not by "terrorists," but by the Assad regime - somewhere, at some time(s) since December. The deadly nerve agent sarin is increasingly specified, for reasons that aren’t entirely clear. All this has kicked off a renewed drive for intervention based on intelligence assessments of WMD dangers, evoking widely-noted memories of the bogus U.S. case for war on Syria’s ally, Iraq, one decade ago. The latest developments cast doubt on the imminence of outright military involvement - yet again. However, the danger persists, the accusations stand as a pressure and a danger to the people of Syria, and the purported casus belli deserves all the scrutiny it’s been getting and more. As this article relates the battle over an investigation of this incident, it should be noted from the start that the case for a rebel attack in Aleppo is stronger and clearer than most realize. Yet that narrative - and that attack in general - have been effectively sidelined, in favor of whole other alleged attacks. It’s only been six weeks since this saga began, but they were weeks of the whirlwind sort. Considering where all the twirling has left us - horribly confused, if not on the brink of war - I offer this article towards un-spinning the record to discover just what happened in that time. Western powers always publicly agreed it was worthy of investigation. Every party was clear that they wanted the truth, and both sides agreed on using terms like "impartial" and "urgent" to describe their solutions. Yet the best approach was consistently disagreed on. The incident in the Otaybah suburb of Damascus does merit a look, but so far there is little to go on – some videos of apparent rebels struggling to breathe, but not even a death toll. The eastern Damascus suburbs around and north of here have witnessed at least three further CW allegations (Aadra March 24, Jobar April 6, Otaybah April 9) with at least one now said to have yielded samples suggesting sarin. The December Homs incident (al-Bayada district) featured several apparent rebel fighters gasping for breath, and various alleged details. More than 100 were reportedly exposed to the unknown gas, with six reportedly killed. This was taken seriously once and investigated by Western governments. The general consensus by mid-January was some kind of riot control gas used in the wrong concentration. The dismissal is not certain, however, and now the incident is back in the limelight, thought by the British and French to require urgent scrutiny. As the following events show, they were apparently onto something. The battle over the scope - with the multi-attack format winning in the end - repeatedly delayed and complicated the original request from the nation of Syria, which remains to be granted. It was quite an impasse. Syria’s request, it could be argued, had been torpedoed. Syria’s stern and narrow insistence on its initial request is clearly part of the impasse that resulted. Given the risks of war, it would seem unwise to refuse cooperation, and the exact reasons they did refuse are not widely or clearly understood. There is the pride issue, and other considerations, like clues of bad faith (leaking letters), and structural signs of duplicity. For example, it was promised that the Khan al-Assal portion of the probe would be handled "initially" and/or "primarily." But a Western diplomat told Reuters on March 27 that the U.N. team would be based in Beirut, Lebanon. That’s clear across Syria from Aleppo, but quite near the sites around Damascus and Homs, which were the "primary" interests, it seems. It’s difficult to imagine a probe that started with these southern addenda finishing with both sites and managing to cross the war-torn nation to Aleppo, all without the process getting derailed first. It is, however, a good formula for denying Syria’s request, even if a team were actually deployed. As nice as that sounds, the OPCW’s director-general is Ahmet Üzümcü, a Turkish career diplomat with possibly compromising links to his belligerent nation. According to his Wikipedia entry, Üzümcü was previously Turkey’s consul in Aleppo, as well as ambassador in Israel and the permanent representative of Turkey to NATO. This could hardly help Syria to feel anything other than threatened; the selected scientists would be, in effect, deciding if they could turn up justification for the US/NATO to openly join in the war against Syria, waged most fiercely so far from Mr. Üzümcü’s home nation. From the outset, there were signs that the West and the U.N.’s leadership intended the requested investigation to lead into Iraq-style inspections of Syria’s closely-watched CW stockpiles. Ban Ki Moon insisted that it would require "unfettered access" to locales not clearly defined, and cryptically noted "It is my hope that the mission would contribute to ensuring the safety and security of chemical weapons stockpiles in Syria." He didn't specify how a technical mission to investigate what happened in one or even three locations would help make Syria's alleged CW more "secure." That it would become a sneak inspections regime in the Iraq vein, however, might explain that strange hope. 1) The investigation, staff, mandate, etc. was to be negotiated between Syria and, specifically, the U.N.'s office for Disarmament Affairs. 3) The "investigators" as originally tasked were increasingly referred to as "inspectors." 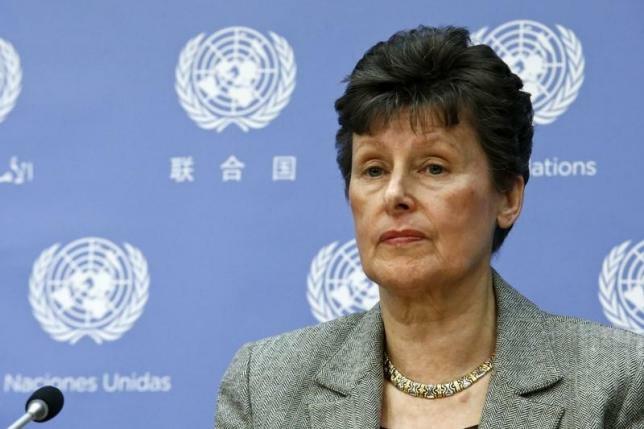 Most Western media reports blame the impasse on Syria, and they did in fact block the U.N. team’s entry. However, as this article shows, there were several questionable actions (and alleged actions) by the other side determining what the "no" came in response to. Most reports cite the scope of attacks to investigate as the only dispute. But these inexplicably invasive aspects seems to be the straws that broke the camel’s back, laid more quietly, right before the audible snap. Therefore, they deserve more scrutiny and explanation. Sarin After the Failure: Confusion Yields to "Confidence"
To be clear, the investigation was not quite fatally sabotaged. In lieu of in-country work, the U.N. says Sellström’s team was working on Cyprus anyway, investigating what they could from there. Spokesman Martin Nesirky told a press briefing “you need to be able to go into Syria to be able to do that investigation properly on site, but in the meantime … information is available without actually visiting Syria." Hypothetically, this could still expand into something more substantial, but past events leave little room to suspect it will. Based on this, most likely, Britain and France wrote separately to the UN on or before April 18, more sure than ever that the Syrians were using chemical weapons, repeatedly, since December. On the 23rd, Israel and its top intelligence people went public as agreeing that sarin was used, citing public imagery and something classified. What they sent the Americans was presented by the White House on the 25th as convincing their intelligence community, "with varying degrees of confidence," that Syria has used chemical weapons including at least sarin, "on a small scale." The report noted there was still caution, especially over chain of custody issues, but this is the closest the Obama administration has come to saying its red line is crossed. As the world was left hovering at this dangerous juncture, questions thankfully were publicly raised. Several good articles, mainstream and alternative, have reported and analyzed these in recent days, and even Western politicians are getting it, sporadically. Syria’s Information Minister Omran al-Zoubi seems at least reasonably justified in saying, as SANA reported on April 26, "the Western sides … want now to hide behind this "fabricated and false" talk ["that chemical weapons were used by the Syrian army in other areas"] to justify their silence on failing the investigation mission requested by Syria and to exonerate the terrorists." The correlation between exoneration and impunity on the one hand, and repetition of crimes on the other, is simply common sense. Repetition should be expected. World powers have been saying these people were likely killed by a government sarin attack. But even as the nerve agent charges evaporate, Jabhat al-Nusra’s stolen chlorine remains a suspect. If this even was a gas attack, please note that some impugn and thus enabled party was again gassing people in Aleppo, less than five days after the threat of investigation there evaporated like the morning fog. ** 2016 Update: They tried in an unexpectedly big way within a few months of that prediction, on the birthday of the "red line" threat/offer almost to the hour ... killing 400-1400 in the Damascus suburbs of Ghouta, just as Ake Sellstrom's team of UN investigators finally arrived there to investigate the Khan al-Assal sarin attack by rebel forces. How's that for irony? First, there was an agreement reached in early July, and a visit by Sellstrom and Kane to Syria on July 24-26, saying they agreed with Damascus "on the way forward," in a joint statement on the 26th. (see here). With the investigation moving forward, rebels launched a desperate offensive to re-take Khan Al-Assal, which succeeded just before the visit, on July 22. This let them commit a massacre of 50 captured soldiers, and perhaps over 100 civilians, likely including witnesses to the attack who now couldn't speak. Unable to visit Khan al-Assal directly, due to security concerns over the rebel occupation, Sellstrom's team arrived in Syria to investigate all three incidents on August 18, two days before the Ghouta incident. Of course they still didn't get to investigate even indirectly in Aleppo, becoming too busy sampling Ghouta locals with token sarin traces, while failing to test any of the actual x-hundred dead bodies (see here). 2018 update: later everyone agreed sarin had been used, and it had the same chemical markers as the kind used in Ghouta, to distract the probe into the first use and maybe get Syria bombed. So, it's widely concluded, the regime launched BOTH attacks with their unique, caustic, impure, foul-smelling sarin which has turned up in most or all attacks since. So as we're to gather: Assad + co. gassed their own on accident, blamed "terrorists," demanded a probe for months, got the team there just in time to distract them with the same sarin dropped next door to kill, like, a million babies, maybe in a miscalculation in their use of that sarin just there and just then. Why? 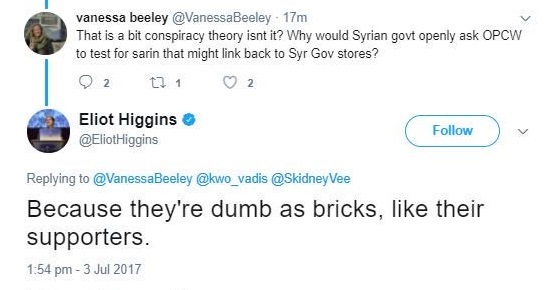 Because they're "dumb as bricks," as Higgins shrugs it off (responding to a different question but to the same effect).